What do you say of an event that presented you with a platform to meet many many more bloggers at one place, gave you one lovely frreebie package :D, allowed you to talk on 'Oh My god! What do I blog next???' and wrap the show up with a brilliant quiz where you end up winning THREE audience prizes?!?! WHEN IS THE NEXT ONE COMING??? Blogcamp 2006 at Chennai's TIDEL park turned out to be a helluva fun event with plenty of fun, food and fundas thrown in! 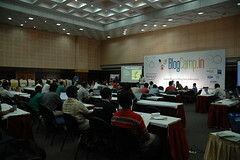 from my place early this morning, I was expecting a good time at the Blogcamp, but definitely not THIS great a time! I totally totally enjoyed every second of it- right from the great 'Strong' Coffee to the 'live blogging sessions' and all the 'un'conferences!!! I'm feeling so much more better as an individual, as a blogger and as a human being after the Blogcamp! Thank you all for putting together the show, attending it and making it that wonderful show that it was! First time, here. Sweet surprise, indeed. WHY did u have to miss it?!??!? You REALLy should have come!!! Wow! I had never heard of such a camp. Sounds like it was a lot of fun. Sigh...sometime in the future perhaps.